The Third International Conference on Small Island Developing States was held in Apia, Samoa in September 2014. It adopted the SAMOA Pathway, which represents the programme of action for the further sustainable development of SIDS for the coming decade. 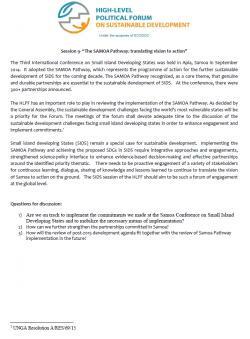 The SAMOA Pathway recognized, as a core theme, that genuine and durable partnerships are essential to the sustainable development of SIDS. At the conference, there were 300+ partnerships announced.